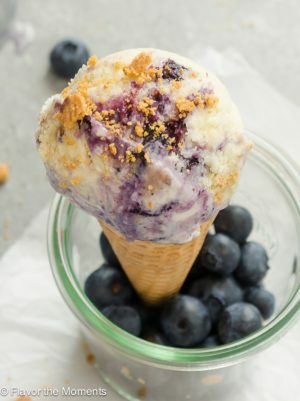 Blueberry Pie Ice Cream is rich and creamy vanilla bean ice cream layered with fresh blueberry sauce and graham cracker crumble. Now you can enjoy blueberry pie in ice cream form! In a medium saucepan, bring the milk, cream, and ½ cup of sugar to a boil, keeping a close eye on it to prevent it from boiling over. In a bowl, whisk the the egg yolks with the remaining ½ cup sugar. Once the milk is boiling, lower the heat to medium low. Using a measuring cup, measure out ½ cup of the hot milk and quickly whisk ¼ cup of it into the egg yolk mixture. Add the remaining ¼ cup a whisk until combined. Pour the egg yolk mixture into the saucepan with the remaining hot milk mixture along with the lemon zest or vanilla bean seeds and pod. Cook, stirring constantly with a wooden spoon and scraping the sides and bottom of the pot, until the custard is thick enough to coat the back of the spoon and leaves a clear trail when a finger is drawn through it on the spoon, about 5 minutes. Do not allow the custard to boil. Pour the custard through a medium mesh sieve set over a clean bowl. Discard the vanilla bean pod. Cover the surface of the custard with plastic wrap to prevent a skin from forming and refrigerate until cold, about 1 hour or overnight. Combine the blueberries, sugar, and salt in a small saucepan over medium heat. Simmer until thickened, stirring occasionally, about 1 hour. While the blueberries are cooking, start churning the ice cream in the ice cream maker according to manufacturer's instructions. Preheat the oven to 350 degrees and line a rimmed baking sheet with parchment paper. In a food processor, pulse half of the crackers to a fine crumb. Add the other half, and pulse just a few times letting some larger pieces remain. Place in a small bowl and stir in the butter and flour until combined. Spread in an even layer on the prepared baking sheet and bake for 10 minutes. Remove from the oven and cool on a wire rack. In a quart-size rigid plastic freezer container, layer about a quarter of the churned vanilla ice cream, then the blueberries, then the crumble. Continue layering three or four times. You will probably have leftover blueberry sauce and crumble to top with your oatmeal or yogurt! Freeze the ice cream for 4 hours, then serve with extra graham cracker crumble. Enjoy! Recipe from Fast to the Table Freezer Cookbook by Becky Rosenthal.